Tastes Like Spring Water. Requires no refrigeration or special handling. Contains no preservatives or additives. Bitter Free! Anthraquinone Free! The digestive tract membranes replicate about every 28 days, for optimum digestive function drink 2 ounces twice daily which is one gallon per month. 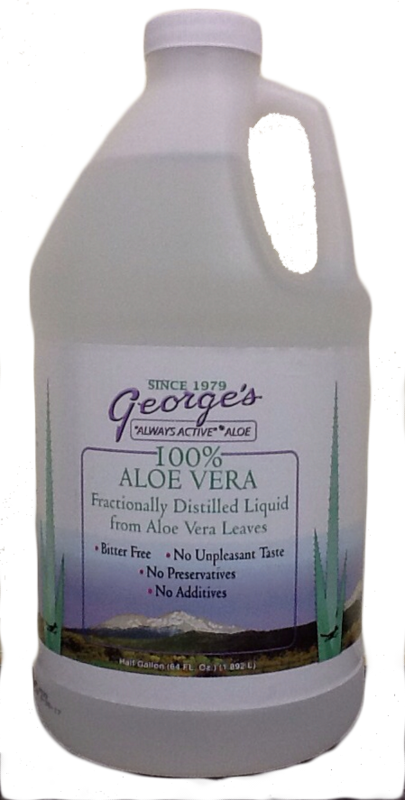 Why isn't George's Aloe Vera thick and greenish in color? Why doesn't it have that bitter taste most other Aloe Vera products have? The thick greenish substance just beneath the rind in the latex layer of the plant is where the aloins and anthraqinones are located. These substances are irritants and when ingested can cause cramping and diarrhea and in some cases nausea. George's Aloe is a refined product. We remove the antagonistic compounds that cause the bitter taste and irritation to the GI tract. For several years we examined various species of Aloe Vera whereby separating the chemical components of the Aloe Vera leaf. We continued to study the effects of Aloe as a food supplement, we found the digestive tract seemed to be the most important factor, other than our parents genes and chromosomes in determining our health and well being. A newborn's food conversion efficiency approaches 100%. However, as we mature our digestive membrane system loses its efficiency and our body thus makes changes to compensate. The aches, pains and malfunctions of the body can result from changes in the digestive process and many of which may have occurred over a number of years.